The discovery of a new series of novels to love is often accompanied by joy (a new lifelong friend!) and resentment (why did none of you tell me about this?). These were precisely my feelings upon finding the Aubrey–Maturin books, a series of twenty naval adventures written by the brilliant British historical novelist Patrick O’Brian (1914–2000). The books take place during the Napoleonic Wars (1803–15) and explore the friendship between Jack Aubrey, a jolly and bellicose naval captain, and Stephen Maturin, his ship’s surgeon, a laudanum-addicted naturalist. Most of the action occurs at sea—the first volume starts on the island of Minorca (at the time a British possession), with Jack waiting desperately to be assigned a ship and Stephen ducking out on his lodgings because he’s unable to pay the rent. Shore time, when it comes in the second volume, is set in the carriages and country houses of England. I realized about halfway through Post Captain that O’Brian is like a male Jane Austen, writing from the point of view of the soldiers who populate Austen’s fiction. As a newly minted O’Brian addict, I feel he deserves an Austen-like cultural renown and am sad that despite his cult status and best-selling run in his own time, it never quite happened. (Master and Commander, a 2003 movie starring Russell Crowe and loosely based on the books, failed to capture the magic.) I can conclude only that the extraordinary depth of the books’ historical detail—especially their verisimilitude regarding naval jargon, which is nearly impenetrable, though it creates a rich texture of “fo’c’sles” and “bosuns”—puts readers off. The dough for plum duff, common sailor’s fare, is tied in a floured tea towel and boiled for hours. Despite the name, no plums are involved in the making of this dessert. The pleasures of the historical setting are great, however, for those who stick with it. 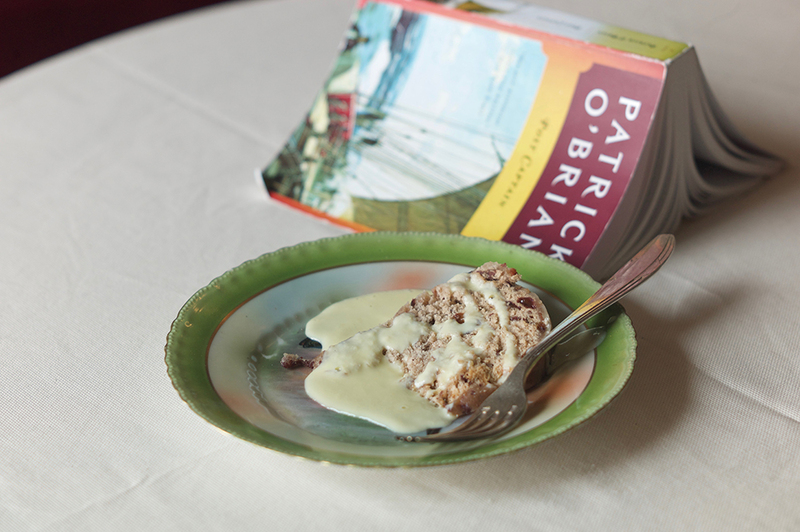 O’Brian places his heroic characters (idealized types, to be true, along the lines of Mr. Darcy and Elizabeth Bennet) in a meticulous environment of lived dailiness, evident everywhere—including the food. Jack’s warmhearted enthusiasm for boats and battles is mirrored by his love of dining, drinking, and dessert, especially. 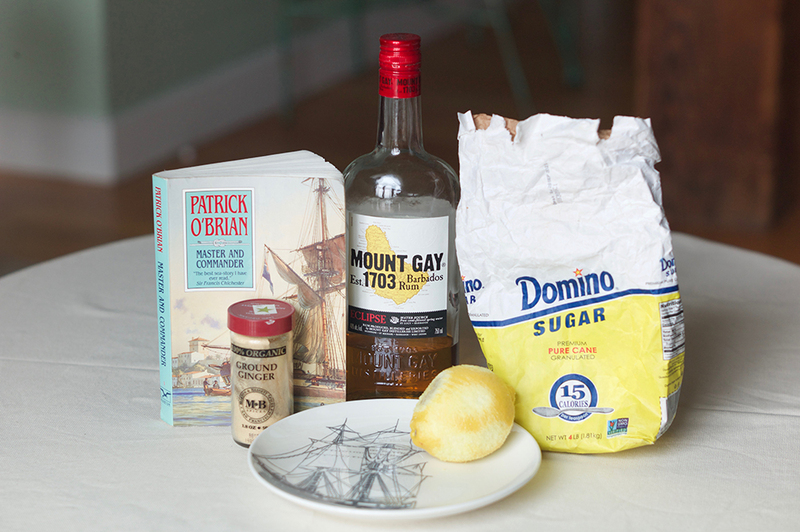 From the opening pages of Master and Commander, when O’Brian tells us the streets of Minorca smell “of olive oil, sardines and wine,” the foods Jack eats (or doesn’t, at the end of a long voyage) bring the time to life. 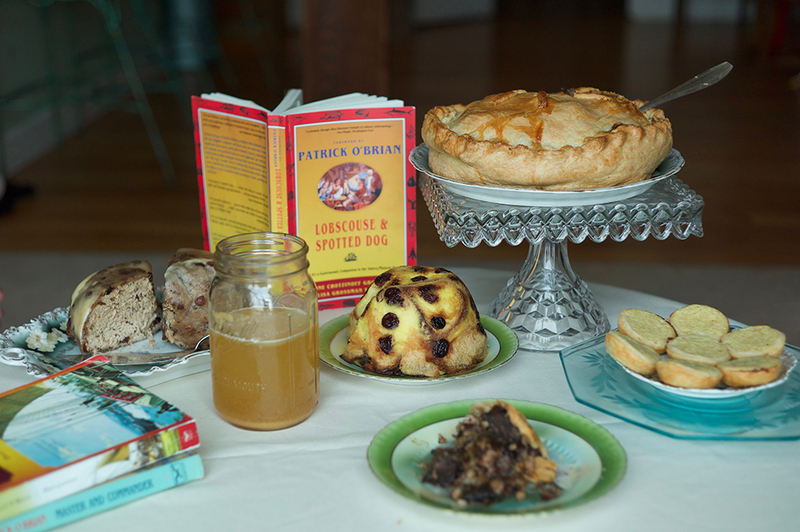 There’s so much food information in the books, in fact, that in 1996, two superfans published Lobscouse and Spotted Dog, a cookbook devoted to historically accurate renditions of dishes from the series, such as hardtack-and-venison pasties, plum duff, boiled mutton, and mince pies. The authors made these foods as closely as possible to how they would have been in the nineteenth century. I used Lobscouse and Spotted Dog to cook a menu from O’Brian, which turned out to be the most fun but least delicious of my culinary adventures to date. I made a hand-raised venison pie (game meats were big in 1800), plus three “puddings,” since Jack loves them, and grog, because I’ve encountered it in literature all my life (it tastes like lemon Theraflu and is not recommended). To hand-raise a pie means to create a crust so stiff that no pie plate or baking vessel is necessary. I’d seen it on The Great British Bake Off but never tried it myself. 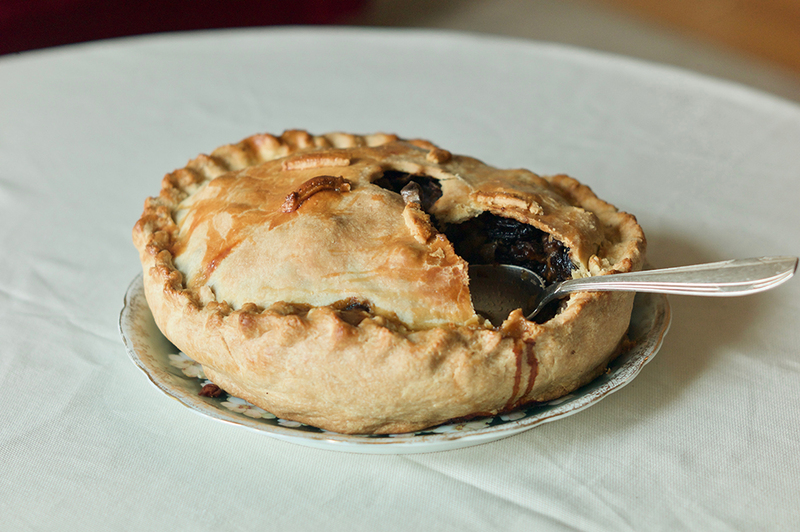 The writers of Lobscouse and Spotted Dog say that “thus crimped and sealed, a pie could keep for weeks, which made it a good way of preserving meat without having to dedicate a precious pot to the purpose.” My crust was fun and easy to make, though not beautiful. 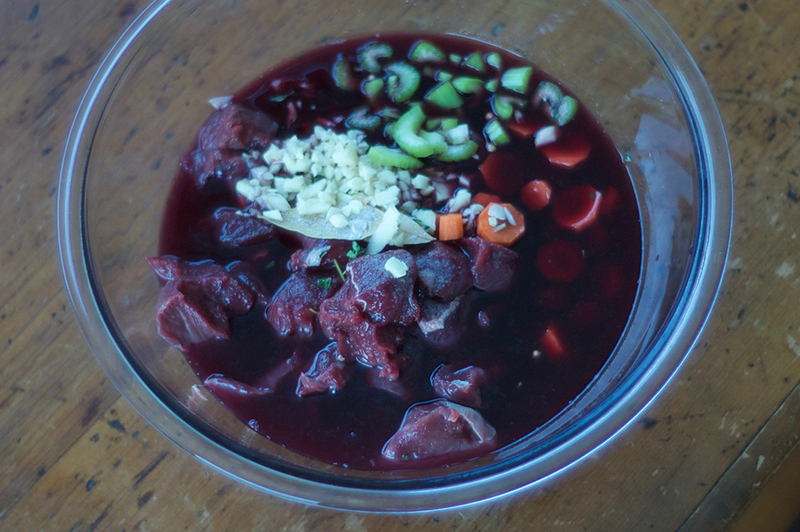 The recipe requires an interior layer of minced meat called forcemeat for added stability and, as a final touch, a hole cut in the top, into which you pour boiling stock just before putting the whole thing in the oven. Hot water and melted fat are the magic ingredients for hot-water paste, a dough that can be shaped like making pottery without a cooking vessel. It doesn’t taste bad either! My other two desserts, to my surprise (I should have read the recipes more carefully), were “pudding” puddings and required lengthy boiling—in two separate ways, no less. 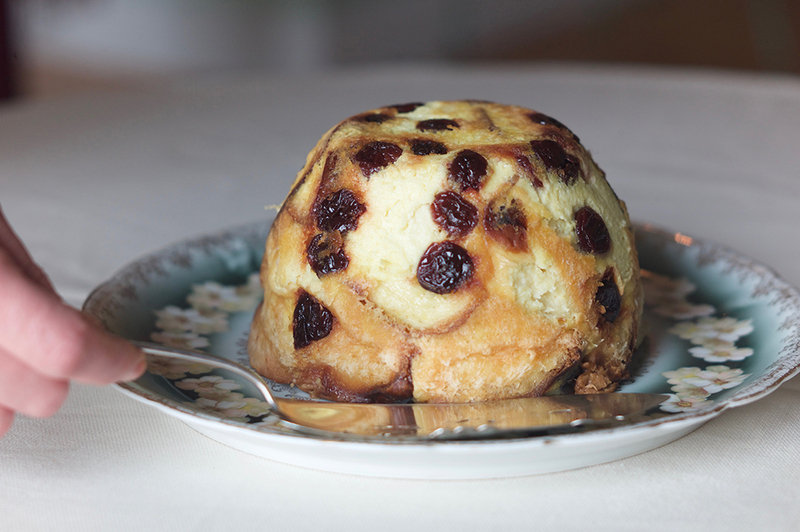 The plum duff, part of the regular roster of meals served at sea, is a sweetened raisin dough (no plums in it despite the name) boiled for an hour and a half while tied in a floured tea towel. 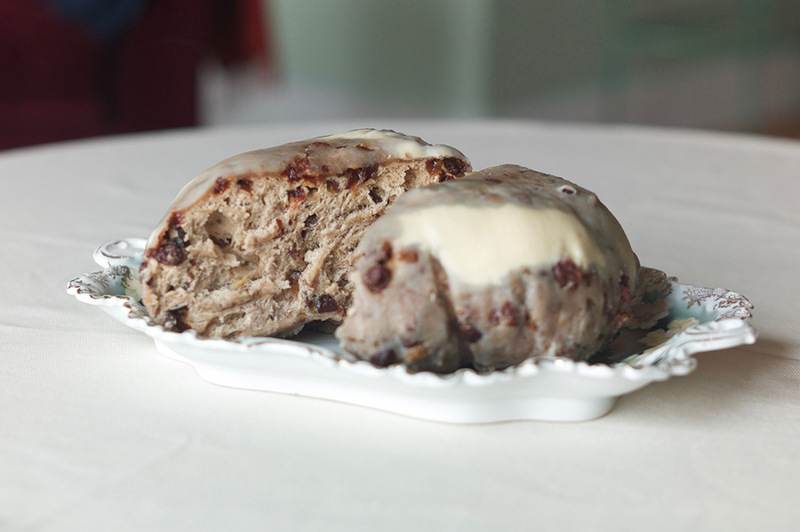 The cabinet pudding is a layered creation of bread, dried cherries, and custard assembled in a metal “pudding basin,” covered with a cloth tied by a string, and then set in boiling water to cook. It appears in volume 4 of the series, The Mauritius Command, as a predictable end to a fancy meal. Miraculously, I had a set of vintage mixing bowls that fit all the criteria of a pudding basin (enameled, seven inches in diameter across the top, three inches across the bottom, and four inches deep, with a lip so the string that ties the towel in place doesn’t slip off), and I was able to set both desserts boiling at once, side by side, on my stove, which made me feel somewhat like a cook in the galley of a nineteenth-century warship. The recipes and the cooking processes created a vivid experience of the limitations of life in a bygone era, when you boiled instead of baked because you didn’t have an oven, and used crusts instead of dishware because objects were precious. Unfortunately, the limitations also affected the flavor of the food. I thought I’d chosen recipes that would be different from one another, but the palate of spices and ingredients was small—rose water, cinnamon, lemon zest, allspice, sugar, raisins, dried fruit, and tons of flour were in almost every dish. The maids of honor tasted like the cabinet pudding, and the cabinet pudding tasted like bland French toast baked in an extremely laborious way. The plum duff was like a cinnamon-raisin bagel with a damp exterior. It was good with the brandied cream sauce, but I think anything would be good with brandied cream sauce, even a wet cinnamon-raisin bagel. I’d have to agree with the authors of Lobscouse and Spotted Dog that “we now have startlingly different notions of what food should taste like.” Nonetheless, making the food was a glorious adventure. 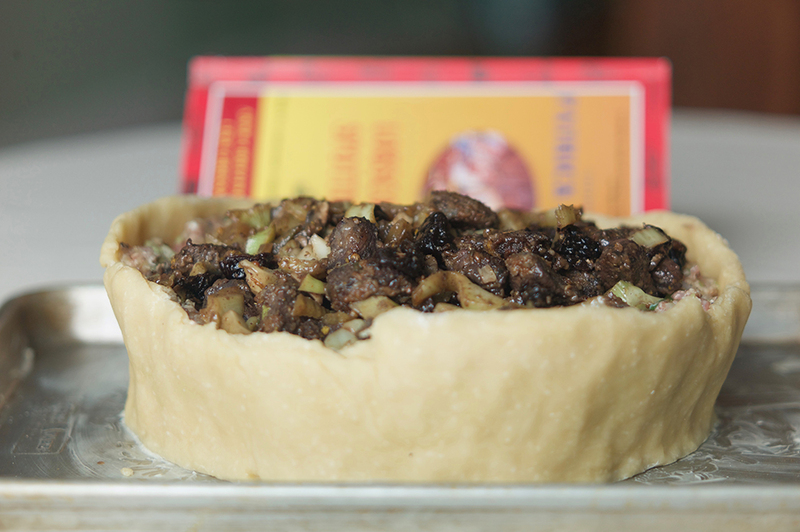 A note on task flow for assembling this pie: The venison needs to marinate for two days before cooking. The raised crust needs around ninety minutes to be shaped and set and must be shaped thirty minutes after the dough is made. You can assemble the fillings while the dough is in progress. Combine all ingredients in a gallon freezer bag, and refrigerate. Warm the water, butter, and lard together over medium heat until the butter and lard have melted. In a large bowl, combine the flour and salt, then add the hot liquid, and mix. Turn the paste out onto a floured surface, and knead until smooth and blended, about three to five minutes. 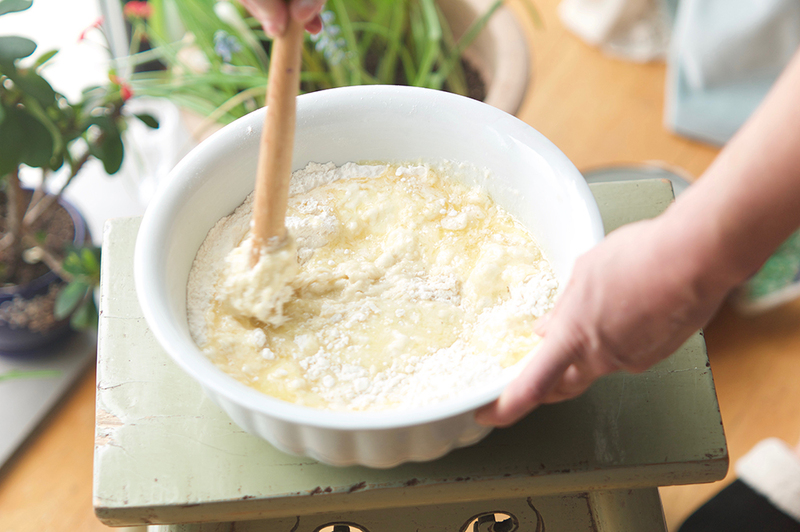 Place the dough in a bowl, cover with a cloth, and let rest in a warm place for at least thirty minutes. Grease a cookie sheet or large pan on which to bake the pie. While the dough is still warm, separate a third of it, and reserve beneath a tea towel, to be used for the top crust and decorations. Take the remaining dough, shape it into a smooth, round ball with no cracks or folds, and place it carefully in the center of the greased cookie sheet. Working gradually, as if you were making a pinch pot, shape the dough into a crude round or oval bowl. The process is best taken in stages: let the dough cool slightly, begin shaping it, let it cool a little more, continue to shape it, and so on. It’s important to keep the dough in one piece; holes or folds, no matter how solidly patched, will compromise the structural integrity of the coffin (the technical term for the pie base). The finished product should be about eight inches across, with walls and a base between half an inch and a quarter of an inch thick. Place in the refrigerator to chill for at least an hour, until hard. Reserving the marinade, remove the venison from the bag, and dry with paper towels. Toss in the seasoned flour. Melt the olive oil and butter together in a large cast-iron pan over high heat. Add the venison—in stages if necessary—and fry until browned on all sides. 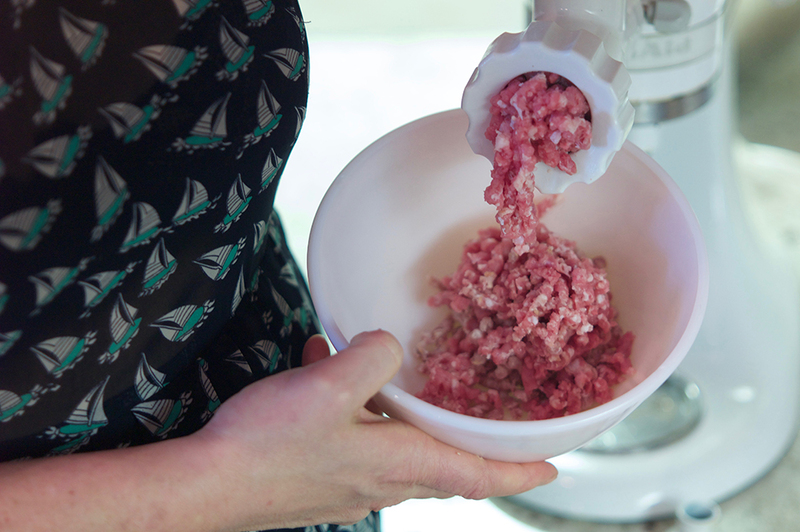 Remove the venison, and transfer to a large bowl. Deglaze the pan with a little bit of the reserved marinade, and add the fennel and mushrooms. Sauté until slightly softened. Add the sautéed vegetables to the venison, along with all the other filling ingredients, and stir to combine. Make an egg wash by combining an egg, beaten, in a small bowl with a teaspoon of warm water. Add the filling, heaping slightly if necessary to fit. 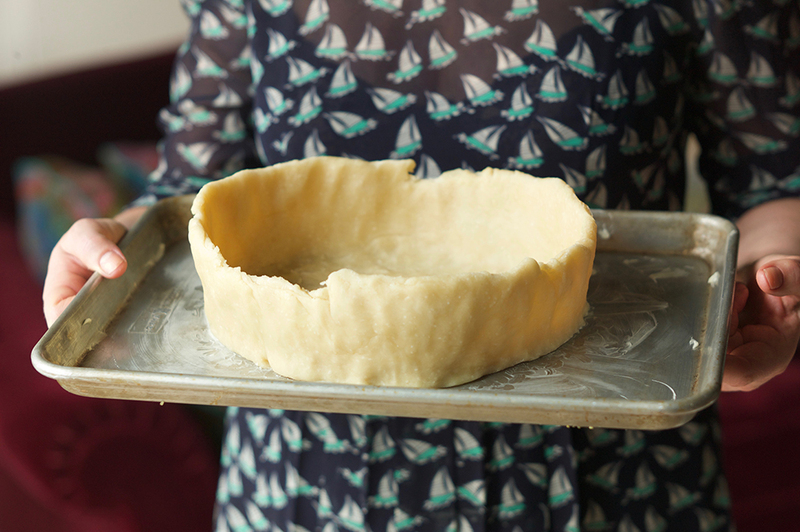 Roll out the remaining crust to a quarter of an inch thick, lift, and drape over the filled pie. Trim any excess so that the top crust overhangs the bottom by about half an inch. Lift the trimmed pie top off the pie (this is a tough dough that should be easy to handle), place it on the work surface, and cut a hole directly in the center, either freehand or with a small cookie cutter. Return the lid to the coffin. Brush the egg wash on the lip of the coffin and the underside of the lid, lifting the lid a little in stages in order to do so. 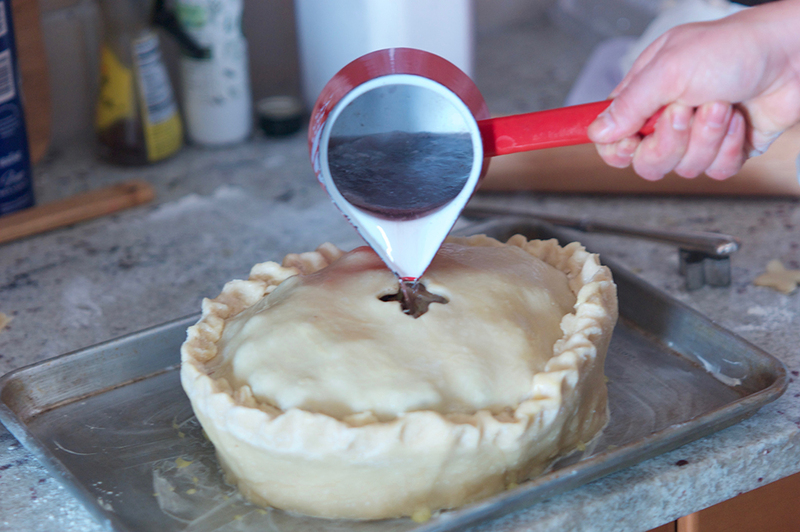 Pinch the doughs together using your method of choice for crimping pies. Egg wash the top of the pie. Roll out the trimmings, and cut into decorative shapes (anchors, sail boats). Place them in a decorative manner, and brush them with more egg wash.
Whisk together the flour, sugar, and salt. Rub in the vegetable shortening with your fingers until fully combined. Refrigerate briefly. Cut in the butter using a pastry cutter. Add the quarter cup of water a few tablespoons at a time, stirring until the mixture holds together. When the dough can be formed into a ball with your hands, wrap in plastic wrap and chill for at least two hours or, ideally, overnight. Combine all filling ingredients and whisk to combine. Butter a twelve-cup muffin tin. Roll out the chilled pastry crust on a floured work surface to a thickness of about a quarter of an inch. 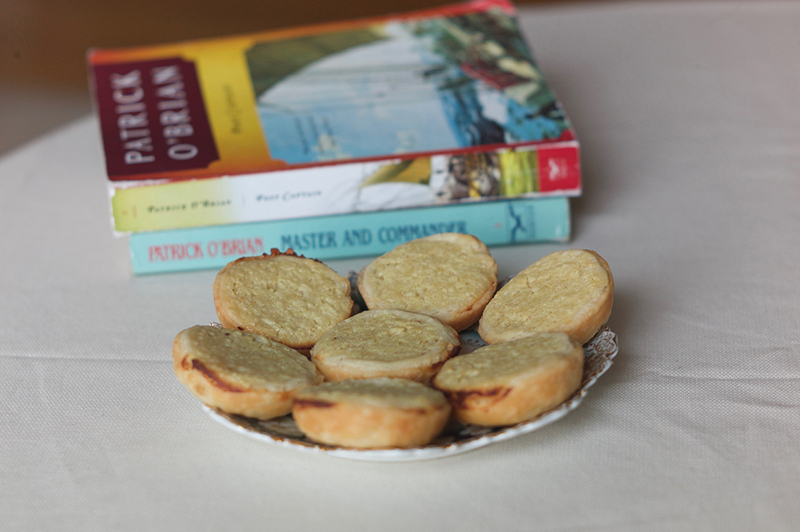 Using a cookie cutter or drinking glass whose circumference is just a little larger than the top opening of the muffin cups, cut twelve rounds of pastry. 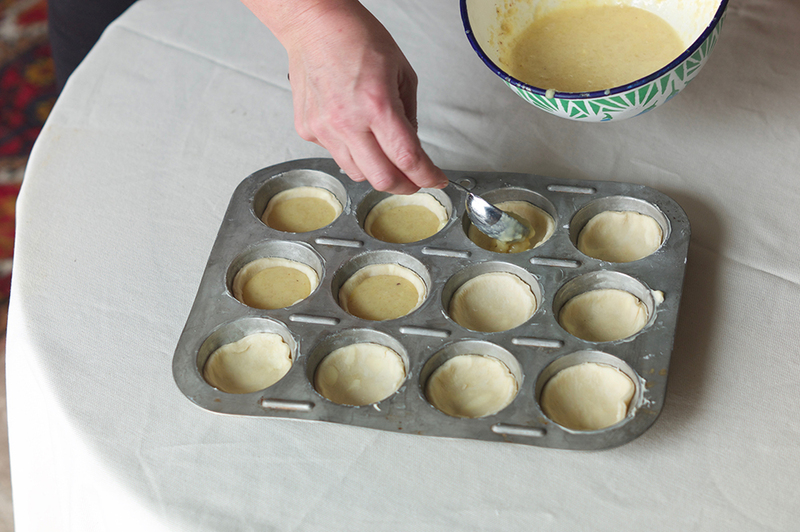 Press them gently into the base of the muffin cups, creating small, shallow tart shells. Place in the freezer for ten minutes or longer. When you’re ready to bake, drop one tablespoon of the filling mixture into each tart shell. Brush the exposed edges of the pastry shells with milk, for browning. Bake for twenty to twenty-five minutes, until the filling is set and the crust is beginning to turn golden. Cool and serve. Combine the egg yolks and sugar in a small nonreactive saucepan, and whisk over low heat until fluffy and pale yellow. Add the milk in a slow stream, stirring continually with a rubber spatula. Turn the heat up to medium, and cook, stirring constantly, until the mixture has thickened (it should coat the spatula, and a finger mark will remain distinct). Remove from the heat, and stir in the rose water and brandy. If the sauce is lumpy, you can strain it through a sieve. Combine yeast, warm water, and two tablespoons of sugar in a large bowl. Set aside for ten minutes to proof the yeast. If the mixture doesn’t begin to froth, discard the ingredients, and start again with fresh yeast. When the yeast has proofed, add the milk, salt, allspice, and cinnamon, and stir. 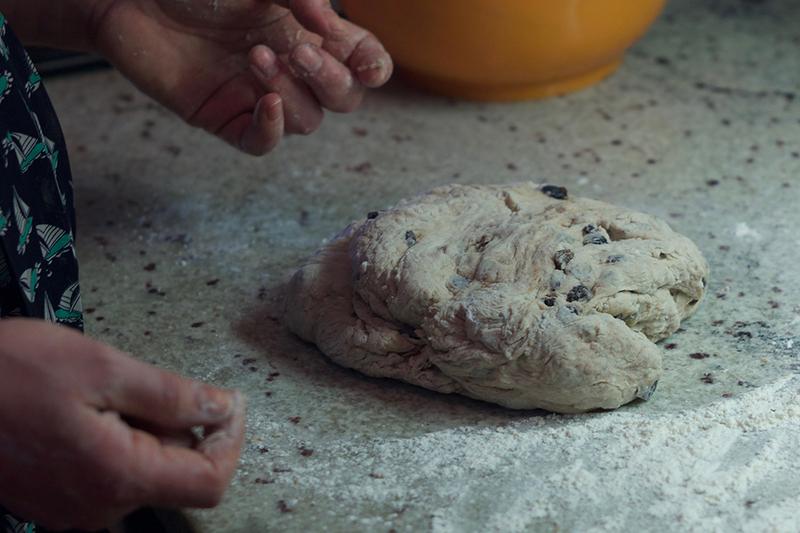 Combine the raisins with the flour (this prevents them from clumping), and add, stirring until the dough forms a shaggy mass. 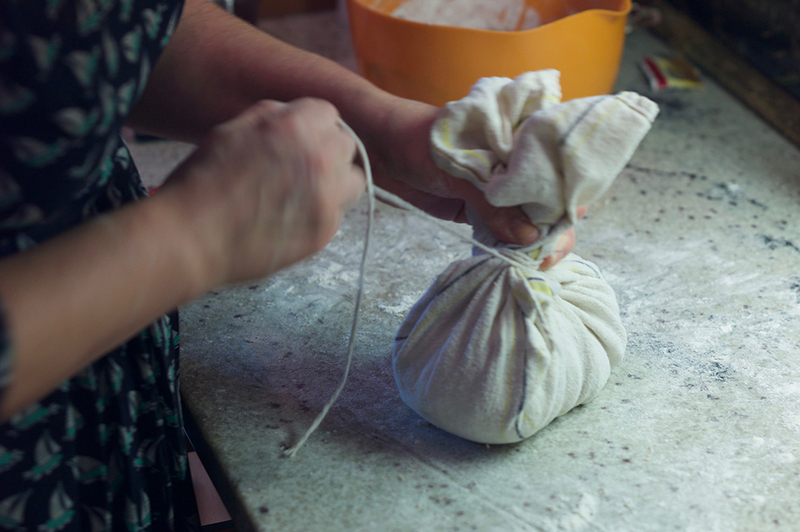 Set aside in a warm location, covered with a tea towel, for an hour or two, until the dough has doubled in volume. When the dough has doubled, prepare your water. Set a large pot three-quarters full of water, covered, on the heat to boil. Turn the dough out onto a floured surface, punch it down, and knead for ten to fifteen minutes, until smooth and elastic. Place the dough on a well-floured tea towel, bring the sides together, and make a loose bundle so the dough has room to expand while cooking. Tie string tightly around the neck. When the water is boiling, drop in the bundle, and cook for an hour and a half, loosely covered, refilling the water as necessary. Cool, slice, and serve with pastry cream. With water, fill a large pot to a depth that will come up to within an inch of the top of the pudding basin but won’t submerge it. Set to boil. Cut the cake or bread in thin slices. Generously butter a six-cup pudding basin (you should have a visible layer of butter). 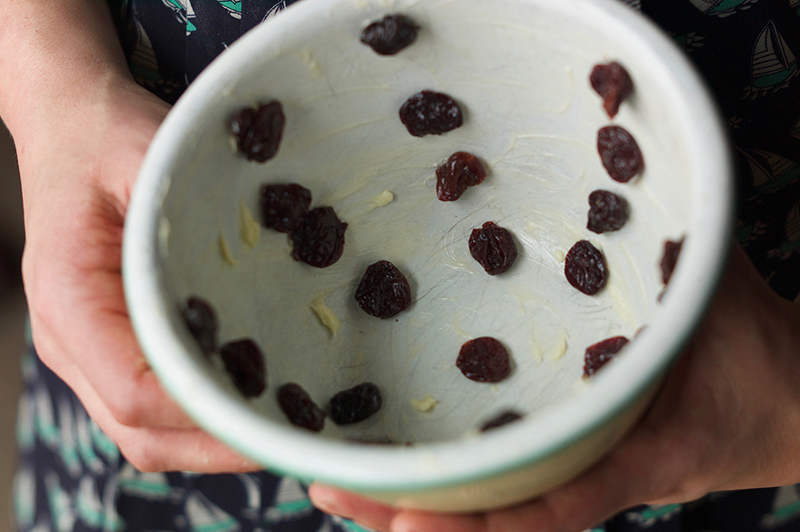 Arrange some of the dried cherries in a decorative pattern in the bottom and up the sides of the basin, sticking them into the butter to adhere. Sprinkle a small amount of lemon zest over the cherries, then place a layer of bread or cake slices in the bottom of the basin. Distribute a handful of cherries on the bread. Continue to build the pudding in alternating layers of cherries, zest, and bread until the bread is used up and the basin is full or nearly so (be sure to end with a layer of bread). In a separate bowl, beat the eggs, then add the cream and sugar, and mix well. Pour the mixture into the pudding basin. Cover with a plate, and let stand fifteen minutes for the custard to saturate the bread. Cover the basin with a tea towel, tie it with kitchen string to secure it, and set in the boiling water. The water should come close to the top of the pudding basin but not cover it. Cover the pot loosely, and boil for an hour and a half, until the pudding is set. Refill the water periodically if need be.